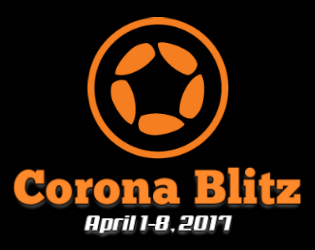 Welcome to Corona Blitz 2017! Corona Blitz is an event organized by Corona SDK Developer Community. It was first organized by Andrew Potozniak in 2013 and the second was held in 2014(here and here). This time he is not around but we are bringing it back! In Corona Blitz, you have to make a game in just 4 hours (see the rules) using Corona SDK! You are allowed use this 4 hours in any way you want. You can either develop your game(s) in a single session or split those 4 hours into several days, however you like it. Corona Blitz started on April 1st and ended on April 10th. You can find jam talks on Corona forums from here. You have to make your game using Corona SDK hence the name. Submit as many games as you want. Thinking of an idea, designing your game or testing gameplay does NOT count against your 4 hours. Only thing that counts as your 4 hours is coding part. You CAN use any assets, libraries and plugins (except "Remove Splash Screen" plugin) that you create, rightfully own or have the right to use it with appropriate licenses but you have to state the corresponding licenses in your game page and your binary. You can NOT use templates of any kind. You can NOT remove "Powered by Corona Labs" splash screen. You HAVE an extra hour for every single submission to make your executable files available for download. Keep in mind that this extra hour is NOT available after the jam period ends. Fall From Grace is a physics-based ragdoll game - descend the pit, recover your lost virtue, face a trial by fire! Patience is a virtue. Test your patience with some simple physics fun. #CoronaBlitz2017 entry. Jump and jet your way over the seven heavenly virtues. Is it better to be a Live Coward or a Dead Hero? Try to get far as you can with this game! Simple 'Rpg' Virtue road to purity!